The original idea was to compare the works of Quentin Tarantino and Ryohgo Narita as a whole, but I found that focusing on Baccano! and Pulp Fiction worked best as the two works had thematic and structural parallels rather than just stylistic ones. In digging into those works more deeply, I discovered just how much both works owed to the legacy of pulp magazines and included a segment in the main post about it. However, as the post ultimately focuses on the idea of chaos and coincidence present in the works, it ultimately just ended up being a tangent that distracted from the overall thesis. So I’m presenting it here instead. The segment itself is still a bit unpolished (again, one of the reasons I cut it), but I was really happy with how a lot of it turned out, especially with the image I managed to find. 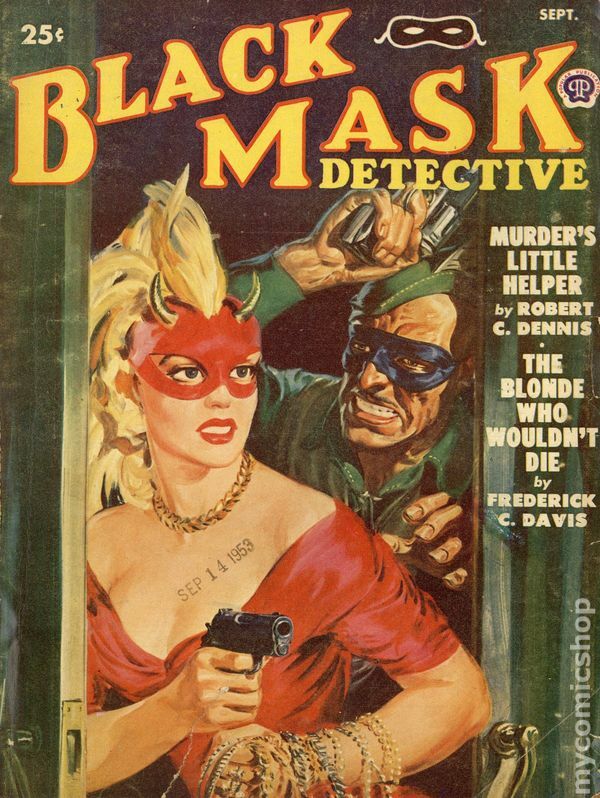 Black Mask was the crime pulp that Pulp Fiction was almost named for, and I managed to find a cover that is at least close enough to Pulp Fiction‘s poster to evoke recognition, but that includes costumed criminals and a story about someone who “wouldn’t die.” Ha! They managed two unintentional Baccano! references on one cover! Anyway, here’s the original “Chapter 1” of “The ‘Baccano‘ of Pulp Fiction.” I hope you enjoy it! To understand the similarities between Baccano! and Pulp Fiction we need to look at the DNA the two share, which the latter is outright named for: pulp magazines. Pulp magazines were cheap fiction magazines popular in the 1920’s and 1930’s, named so for the inexpensive, low-quality wood pulp paper they were printed on. These were usually genre fiction, and they were designed to be cheap, easily consumable entertainment. The light novel industry could be considered in many ways to be a Japanese successor to pulp magazines. Both are also known for their sensational nature, and while light novels are rarely as outright exploitative as pulps tended to be in terms of violence or substance abuse, light novels have a reputation for being filled with degenerative sexuality in the same way that many pulps had a reputation for being saucy. They both are known for being industries with a lot of interplay, with light novel authors frequently referencing each others’ works and well-known pulp characters being written by multiple authors. Many light novels are published in anthology magazines in a similar manner to pulps, and both are known for seeking out a lot of new talent. Their authors are frequently, perhaps because of the low cost of pulps and light novels, known for being prolific. Perhaps because of this, both have a reputation for focusing on quantity over quantity, and are often seen as cheap, poorly-manufactured low-brow entertainment. The pulp style also extends into films, usually with blockbuster films (especially in the current superhero-saturated market, considering that superheroes comics were descended from hero pulps). These are sometimes referred to as “popcorn movies,” as they’re the types of movies one might eat popcorn to. However, it’s also an apt term since the movies, like popcorn itself, have a reputation for being light, fluffy, and enjoyable, but not filling. They’re simply snacks rather than something more substantial. This is the legacy that both Baccano! and Pulp Fiction fall into even more than their contemporaries: violent, exploitative stories filled with crime, drugs, and alcohol, designed to entertain the masses instead of scintillate a more high-brow crowd. This is not, of course, to diminish the value of the pulp style. Just because a style lacks substance does not mean it lacks artistry. In fact, works dedicated purely to entertain can be surprisingly difficult to pull off. To truly be good, a pulpy story usually needs to find the perfect blend of action, grit, and levity. Too much levity and it becomes campy, too much grit and it becomes unpleasant. If the right balance is struck, however, the action becomes exhilarating, the grit adds some kick, and the levity makes it entertaining. This is the style of story Tarantino and Narita excel at: stories that are pointless and dumb…but they’re fun.